Set in the vibrant downtown area on the south bank of St. John's River, this modern oasis features southern hospitality, contemporary design and exceptional amenities. 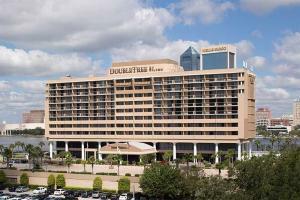 This riverfront hotel is close to the Jacksonville Landing, Friendship Fountain and the Jacksonville Zoo. The 293 well-appointed rooms and suites offer a relaxing space to unwind after a day exploring the city, and feature HDTVs and balconies with beautiful views of downtown Jacksonville. Located in Jacksonville, Florida, about 15 miles from the airport. Lobby Lounge, Riverview Lounge, Ruth's Chris Steak House, St. Johns Provision Co.